Album released on the Sunniest day of April 2018 and is available to purchase from our WebStore, and some other places from Discography page. 8 tunes medley, a genuine live recording. Concert was titled "From Serbia with Love" and Branco was promoting his new music book/album "ALONE" dedicated to Nikola Tesla. Click here to hear the unalloyed music and totally silent the full-house captivating audience and Branco’s healthy and Sunny wit and humour between the tunes too. © B.Stoysin. All Rights Reserved. SOLO GUITAR "Aurora Tesla" > ORIGINAL LYRICAL MUSIC (clip from the new music book/album). The book is dedicated to Nikola Tesla. Click here to watch, 3:23 of a concise enlightenment. © B.Stoysin. All rights reserved. Click here to watch this snappy advert that tells all you need to know about Sun Recordings motto and releases in a most concise way. © B.Stoysin. All rights reserved. Click here to watch a snappy 60 secs advert for this beautiful music book featuring notations and arrangements of enthralling 18 pieces of trad folk music from Serbia and former Yugoslavia and Branco's originals in the genre, as performed on wordlwide acclaimed same title album. © B.Stoysin. All rights reserved. Lyrical and tranquil solo-guitar tune "After All, Peace Will Come"
You're here for a special treat. Click here to listen to a whole solo acoustic guitar track "After All, Peace Will Come" while you enjoy watching Branco's beautiful fine art photography of all the natural and beautiful...© B.Stoysin. All rights reserved. A snappy and happy solo-guitar tune "Little Feet"
Click here. Enjoy listening while you're watching free tutorial on how to restring your acoustic guitar. © B.Stoysin. All Rights Reserved. Branco Stoysin Trio LIVE at City of London Festival, St Giles Cripplegate. Watch and listen 4 tunes medley. It's the closest to heaven you'll be taken by a music. All tunes by B.Stoysin. © B.Stoysin. All rights reserved. BST live at Under Ground Theatre, Eastbourne. 7 tunes medley. Feel the hot Sun, mellow Sun and the ovations by the audience and of course humour and laugh as only BST can. No need for any Sun glasses or Sun-screen protection © B.Stoysin. All rights reserved. 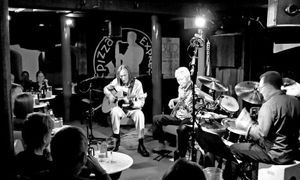 Live at EXPRESS JAZZ CLUB, London. All video clips on this page are GENUINE LIVE RECORDING with a single stereo mike by A-T and camcorder, no digital editing of the music and sound! Really be there, see the trio in action and hear response by the audience...To buy 8 track DVD go to our Web Store or Discography page. © B.Stoysin. All rights reserved. Click on the individual title track to watch the video. NEW!!! Live Radio interview A World in London on Resonance FM (Cultural Co-Operation) with DJ Ritu and Branco, a panacea for the soul, talk about music creation, the Sun, Tesla and topics of today's world, wisdom and wit, a must-hear interview, click here to listen and watch. Live Radio interview A World in London on Resonance FM (Cultural Co-Operation) with DJ Ritu and Branco, we talk about my home-land, trad. folk roots, creation, Nikola Tesla, living in London, Sun and Sunflowers, photography etc, 18 minutes. Click here to listen. YouTube video. All Rights Reserved. THE LATEST: Live Radio interview on SOAS Radio, World In London with DJ Ritu, Branco's new album "Above The Clouds", to listen click HERE, real warmly human interview and lots of music from the album. Live stream file.